7 May 2018 Last week of homework...see you next year! 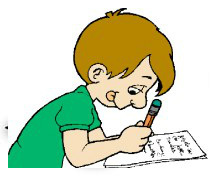 One 5 minutes write and a one literacy activity is expected to be done by Friday each week and turned in by 9:00 a.m. If homework is not done and/or turned in the student will be expected to complete their work the first ten minutes of morning recess. Homework is no longer posted due to the variety of differentiated worksheets. Homework is a page that is taken from their Singapore Workbook. We started doing this for homework after holiday break for several reasons. One reason in particular was scaffolding purposes. The beauty of a multi-level classroom is that we are able to reach each individual student with his or her unique needs. We do, however have to rely on independent practice to balance student-to-teacher time. We utilized Singapore as an option, but found DreamBox to be more appropriate for their independent time during class. We still love Singapore and began using it for homework. It does not always coordinate with classroom work, nor does DreamBox. This shouldn’t matter as they have the pre-mastered skills to complete their homework. If this is ever not the case please have them return their homework and we can go over it together. Typically we send home one page that should take 10 minutes. Your kiddo should be able to completely finish the homework on their own. Math homework is handed out on Monday's and is due by Friday.